More and more homeowners are adding value to their property – and lifestyle – by creating outdoor living spaces. When it’s time to think outside the home, it’s time to include that new roof in your plans. Wouldn’t you love to have an outdoor kitchen for al fresco cooking, dining and entertaining? Or a spa-like relaxation area complete with a pool, deck, hot tub or even a sauna? See how much of your new roof will be visible from your backyard? Consider it an element of your exterior decorating! Maybe you’d prefer the quieter charms of a graceful gazebo amid a zen meditation garden or just a restful conversation area on your deck or patio? The shingle colors of these roofs blend harmoniously with the natural surroundings, gardens and landscaping. Altogether beautiful! No matter what your backyard dream is, you’ll be seeing a lot more of your roof when you spend that much time outside. So the asphalt shingles you choose for your roof should be beautiful to behold and make a personal statement about those who live under its protection. Can a roof really express a homeowner’s personality? Yes! 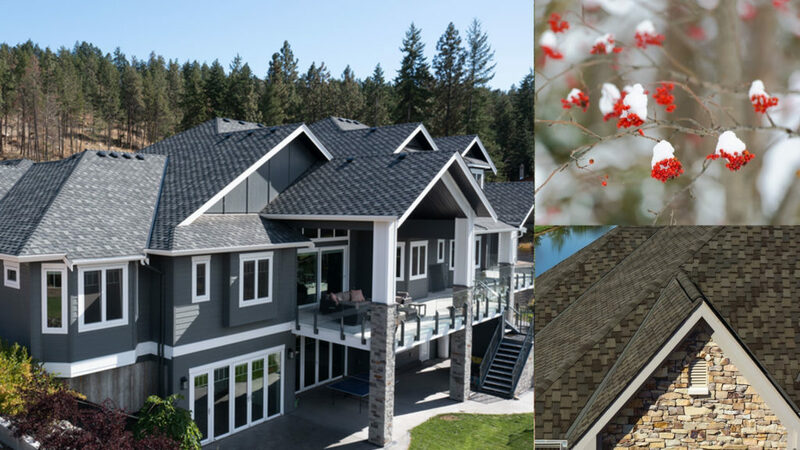 Depending on the style of home and the color of the roofing shingles you choose, you can create a warm, welcoming vibe or a bold, dramatic statement. You can opt for traditional elegance or an ultra-contemporary urban chic. The right color and style of roofing shingles will also make a great first impression from the front of your home, enhancing its curb appeal and potentially boosting its resale value. A new roof is a big investment that you – and your neighbors – will have to live with for many years. According to industry research, one of the greatest challenges many homeowners face is how to match shingle colors that complement their home. 1. Your roof can account for up to 40% of your home’s visual exterior, so it deserves as much consideration as you’d devote to its interior design. The higher the pitch or the greater the slope of your roof, the more you’ll see the shingles from street level. When selecting your asphalt roofing shingles, choose a color and profile that will enhance your home’s architectural style and draw the eye upward toward any special details, like dormers and gables. 2. Color is too important a factor to ignore. Not only does it have a psychological effect (calming, soothing, exciting, etc.) on us, it can serve other purposes that we’ll explore more fully below. 3. How to choose shingle colors that complement your home? It’s helpful to start by thinking big. Then narrow down your choices. Here’s how. 4. The first question to ask yourself is where do you live? In the past, light-colored asphalt shingles weren’t as prevalent in the humid southern climate. Today, however, the addition of special algae-resistant granules that help inhibit the growth of blue-green algae helps reduce the appearance of harmless but unsightly black streaks. Lighter-colored roofing shingles may help keep the home’s interior cooler, depending on how effective the insulation and ventilation are. Notice how the homeowner chose solid dark grey shingles because of the multicolored brickwork and intricate trim, then picked up those brick colors for the accents of shutters, doors and eavestroughing. It all works! 5. In the north, natural sunlight has a cool, bluish cast to it; the farther south you go, the warmer and more reddish the character of the light becomes. The same color blend of cool greys and icy blues that looks so fantastic on a home in New England might look washed out in the orange sunset glow of the Desert Southwest or the tropical light of Florida. When choosing a shingle color to match your home, always look at actual samples in different light conditions and remember that natural light varies considerably by location, not just time of day. 6. Construction and building materials can also vary by geographic location. Here are two examples, and how they might affect choosing a shingle color for your roof. Brick homes are more prevalent in northern areas; in southern areas, frame or stucco homes tend to be more common. Other facings often used in both areas include masonry, stone veneer, wood logs, wood or vinyl siding. If the brickwork had had a patchwork of various colors, this choice might have clashed. Suggested shingle colors for red brick houses: dark brown, black, grey, green. Suggested shingle colors for grey houses: grey, black, green, blue, white. 7. People often ask what color of shingle goes with such and such a color of house? Shingle colors for beige or cream-colored houses include brown, black, grey, green, blue in solid colors or an exciting color blend, as long as it doesn’t clash with the other exterior elements. Shingle colors for brown houses include grey, brown, black, green and possibly blue. White houses allow the roof to be a truly blank canvas. Almost any color will look fantastic; it comes down to other variables, such as your neighborhood, home’s architectural style and your personal preference. Shingle colors for white houses include brown, grey, black, green, blue, white. Shingle colors for weathered wood or log houses include brown, green, black, grey. Consider a shingle with a high-definition profile to mimic the look of natural wood shakes. Shown below are IKO Dynasty Performance shingles in Glacier. 8. Darker colors absorb heat. Lighter colors reflect heat and may help keep your home cooler, although you have to take what some say about energy savings with a grain of salt. Adequate ventilation and the quality of your home’s insulation are what really determine its energy efficiency. 9. That said, colors that are highly reflective may be required in some states to meet environmental codes. A local roofing contractor will know if this applies and can guide you in selecting a shingle color. California building codes now require “cool roofs” that are Title 24-compliant, in order to help reduce a home’s carbon footprint. Look for asphalt roofing shingles manufactured with special, high-reflectance granules embedded in them. They’re engineered to reflect the sun’s radiant heat and are available in a surprising range of colors, from white and grey to darker shades of grey and brown. 10. Let your home’s exterior elements guide you in matching shingle colors. While wood siding can be painted, most facings are there to stay and can’t be easily changed: brickwork, stone or masonry, vinyl siding, cedar logs, stucco, etc. 11. Be mindful of your neighbors. You don’t want your home to stand out for the wrong reasons, especially when it comes time to sell it, so choose a shingle color that harmonizes well with the houses around yours as well as with the natural surroundings and your landscaping. The neighboring homes in this subdivision are similar in style but their facings are of different hues. 12. What’s your home’s architectural style? Always select a shingle color that complements yet contrasts with your home’s exterior elements, no matter what style of home you have. If everything matches, the overall look will be bland and boring. Victorian, Queen Anne, Colonial, Plantation and other historical homes look best in traditional colors. Choose dark grey or black, either in solid colors or varying shades to mimic the look of natural slate tiles or brown, to evoke the look of genuine wood shake construction. Dark green or blue might work well too, depending on the color of your current siding and facing. This graceful Victorian home with its cream-colored siding, red brick chimney and street-level posts remains true to character with these dimensional roofing shingles in varying shades of brown. Asphalt shingles are ideal for roofing those challenging angles, multiple planes and rounded turrets too. Rustic homes, waterfront or rural properties have a more casual, less formal, look. Weathered browns and greys, muted greens will complement natural surroundings and the home’s relaxed vibe. Check out laminated shingles whose profile looks like genuine wood shakes or even slate tiles. Suggested shingle colors for weathered wood or log houses: brown, green, black, grey. Rural homes, whether of log, wood or stone construction, can look warm, casual and inviting yet very dramatic, as the choice of grey roofing shingles emulating slate tiles shows here. 13. Always mix patterns with care, especially if the color of the facing and the roofing shingles being considered already contrast with each other. A good rule of thumb is to mix patterns ON your home the way you’d mix them IN your home; i.e., combine a large print with a smaller print in a complementary color. For example, does your home’s facing feature a pattern of multicolored bricks? Then roofing shingles in a multicolored color blend may or may not be a good choice, depending on how large or busy the pattern of bricks is. Similarly, if your facing is a stone veneer of very large, randomly sized and multicolored fieldstones, roofing shingles with a prominent texture or multiple colors are likely to compete or clash. Here’s a great example of successfully mixing patterns. This home features two different facings in two different colors, yet the pattern and color of the chosen shingles work well with both. Why? Because this particular color blend picks up the grey, brown and white of each. Shown are IKO Crowne Slate Premium Designer shingles in Regal Stone. 14. Do you want to hide or enhance? Enlarge or reduce? A roof of light-colored asphalt shingles can make your home appear larger and draw attention to any positive features, while darker colors can hide imperfections and create focus. 15. Outbuildings need roofs too. Asphalt roofing shingles can also protect and enhance a variety of other structures, such as detached garages, tool sheds, barns, guest houses, gazebos – even dog houses! This grey and brown color blend is an excellent roofing shingle choice based on the siding, wood beam accents and stone facing of this outdoor structure and its surrounding greenery. 16. Try before you buy. You’d never choose a paint color without taking sample chips home and looking at them against the walls to be painted in various lighting conditions, so always look at actual shingle samples at different times of day against all of your home’s exterior elements to make sure that what you see is what you’ll get. Remember to look at existing roofs in your community that have the same shingles and color blends for inspiration – and confirmation – too. Here are some of the spectacular color blends in the IKO Cambridge line. 17. Still stuck for ideas or having trouble visualizing your choices? Check out how different asphalt roofing shingle styles and colors will look on various types and colors of home with IKO’s RoofviewerTM app. It’s free! You can even upload a photo of your actual house and try on different colors to see what will make your home look absolutely stunning, the envy of your neighborhood. Download your free app here and get designing right away. To ensure complete satisfaction, please view several full size shingles and an actual roof installation prior to final color selection as the shingle swatches and photography shown online, in brochures and in our app may not accurately reflect shingle color and do not fully represent the entire color blend range, nor the impact of sunlight. IKO’s Roofviewer app is easy to use, quick to download and a real time-saver. Best of all, it’s free!